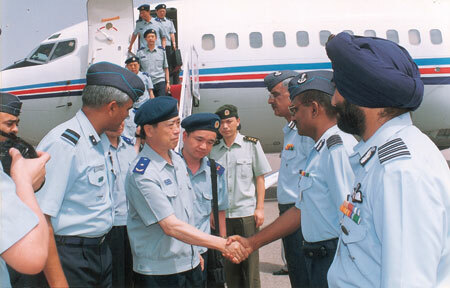 In late June, together with other students of the Advanced Course of the PLA Air Force Command Institute, I made a study trip to India, during which we visited the Indian Air Force units and schools, watched their trainings, aircraft assembling, and maintenance and repair, and listened to the briefings given by the departments concerned. Throughout the visit I was deeply impressed by the advanced concept of the Indian Air Force, and their remarkable rules and regulations and scientific way of doing things. The Indian Air Force believes that officers shoulder the task of producing effective fighting units by combining advanced equipment with well-trained soldiers. The experience of the past wars has proved that the most effective way to achieve this is to improve the quality of commanders. According to the Indian Air Force, the competence and strong leadership of commanders are decisive factors in war, and the cohesion of troops, to a great extent, depends on the quality, art of leadership, professionalism and dedication of commanders. The Indian Air Force also holds that if officers, especially high-ranking officers, are poor in quality, it would result in incompetence of the whole armed forces and to support such an armed forces would be "a great loss of money" for the country. A 58-member Chinese delegation comprising high-ranking officials of Peoples' Liberation Air Force of China visited Air Force Station, Jodhpur. This was part of the ongoing goodwill mission of the Chinese Air Force to various stations of Air Force. The visiting team consisting of eight Major Generals and other senior Air Force officers was given a hearty welcome by the Air Officer Commanding, Jodhpur Station, Air Cmde AR Nigam. During its visit, the team interacted with senior officers of the station while witnessing various facilities of the base and static display of equipments. The delegation also visited Air Force Heritage Museum. The delegation, while on a tour of the Sun City, was impressed with the historical monuments and architecture in and around Jodhpur. The Air Officer Commanding hosted a banquet in the honour of the visiting delegation. Later, the delegation left for Delhi. One of the prominent features of the Indian Air Force in talents cultivation is to avoid randomness. There are specific, rational and complete rules and regulations to ensure the smooth operation of talents policy throughout the process from the import to export of talents. The Indian Air Force has worked out perfect regulatory systems for recruitment of new recruits, enrolment of cadets by military schools, enrolment of pilots and flying instructors. In 1989, the Indian Air Force officially issued "Temporary Regulations on Recruitment", requiring all the recruits to be secondary school graduates in addition to their political and physical qualifications; for junior military schools, all their students must have official 12-year secondary school diplomas; candidate pilots must hold university degrees in addition to their physical, psychological and moral qualifications; flying instructors must be up to even higher standards. For example, they must have flied for more than 7 to 13 years, with total flying hours no less than 500 hours. The Indian Air Force has a set of strict rules governing the selection and promotion of officers and transfer of officers' posts. Its training is strict and specific. Flying instructors must complete their training before they are assigned to the posts or before they are promoted to higher posts. Officers have to go to different colleges or institutes to receive training, before they have chance to be promoted. An Indian Air Force commanding officer, if he is to be promoted from pilot officer to air commodore, must receive training in military colleges for 6 to 10 times, and each training course lasts for 3 months to 1 year. The Indian Air Force holds that military talents cultivation should mainly rely on military schools, and the military school education should be given priority in the development of the armed forces due to its strategic importance. At the same time, national education system should play an important supplementary role. The Indian Air Force training system has a full range of schools. At the moment, the Indian armed forces have 102 military schools, of which 51 are air force schools (and in addition there are 20 other training organizations for the Air Force). They fall under three categories: command schools for training commanding officers and staff officers which are the main body of the schools of the Indian Air Force; schools for training grassroots backbones, including junior officers, warrant officers and NCOs; schools for training all kinds of technical support personnel. As far as the system is concerned, these schools can be classified into junior schools, intermediate schools and advanced schools. While letting the military school education playing the leading role, the Indian Air Force also attaches great importance to relying on national educational system in its efforts to cultivate military talents. For regular universities and research institutes in India, in addition to train talents for civilian purpose, they also cultivate military talents. The Indian Air Force not only recruits outstanding graduates directly from civilian universities, but also sends military personnel to study in civilian colleges or scientific research institutes for further training or education. In addition, the Indian Air Force also sends outstanding commanding officers to study in the U.S., the U.K., Russia, Canada and other countries to further their studies or learn more advanced technologies or training methods.